Derek Flint: Why did that eagle attack me? Henchman: He's been trained to recognize and attack Americans. Derek Flint: An anti-American eagle. It's diabolical. 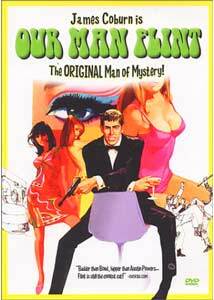 Derek Flint (James Coburn) has the answer to nearly every situation known to man. If the official film dictionary had an entry titled "cool," the example listed would be Flint. Enemies may chase him from every corner, and the building may be about to explode, but he hardly registers any signs of nervousness. An idol for Austin Powers, Flint utilizes an encyclopedic mind that is able to outwit the plans of any foe. In terms of female companions, why have just one when you can have four? The stylish and free atmosphere of the 1960s springs to life in Our Man Flint, an entertaining if slightly ridiculous spy film with a virtually invincible hero. Three brilliant scientists have developed a process that allows them to control the weather in all sections of the world. The heads of state are powerless to combat this menace, so they turn to the only man with the skills needed to succeed: Derek Flint. Unlike a bound employee of the government like James Bond, he is not required to accept the mission. When his short-tempered, frustrated boss Cramden (Lee J. Cobb) requests his assistance, Flint surprisingly refuses numerous times. Once the mission begins, several assassination attempts quickly shows that the enemy means business. The methods are a bit clumsy, but it still takes some deft moves from the spy to succeed. His primary opponent is the luscious Gila (Gila Golan), who utilizes her considerable charms to lure Flint into trouble. Golan was Miss Israel in 1961, and while the acting is not spectacular, her stunning looks overcome any shortcomings. James Coburn has the right countenance to exude the necessary blend of cool and intelligence, but he lacks a certain style you would expect from this character. It is worth seeing this film just to witness his ridiculous dancing, which showcases little rhythm and some peculiar facial expressions. His tall, lanky frame may not resemble the usual action hero, but it does correspond with this meditative character. He seems comfortable within nearly any situation (except dancing), which allows Flint to live through an array of dangerous situations. Moving through Marseille and Rome, the action eventually culminates within a volcanic island that houses the enemy base. Another odd inclusion is the "pleasure area," where women are brainwashed to exist only for their male companions. However, these attractive drones are able to have loads of fun dancing crazily, which apparently is a side effect of the hypnosis. Flint�s smooth movement through this area to save his four women is one of the better sequences in the film. The finale suffers from the lack of an effective villain to match wits with the hero. Malcolm Rodney (Edward Mulhare) comes the closest, but his snide actions never create a formidable persona. We get the feeling that Flint could dismiss Rodney at any time and is way too smart to lose to this weasel. While viewing Our Man Flint, I noticed just how many elements the Austin Powers films have spoofed from this picture. The most obvious is the sound of the presidential red phone, which is the exact same as Austin's boss' call. Flint also flies his own private plane, which is unfortunately not composed of gaudy colors. They both have a way with the ladies, and find ridiculous ways to overcome tough situations. While Austin also takes considerably from the Bond films, he seems modeled closer to Flint's free persona of the 1960s. I could easily criticize numerous elements of this story, but I was enjoying it too much to care. I wouldn't place Derek Flint on the level of James Bond, but he does have more fun. Image Transfer Review: The bright colors and stylish clothes of the 1960s shine nicely on this 2.35:1 widescreen anamorphic transfer. All types of reds, blues and more extravagant hues appear impressively and contain few touches of grain. This picture does show some age and lacks the pristine clarity inherent in newer films, but this is no major surprise. It is fairly rare to witness a premier transfer from more than 30 years ago unless it's one of the most popular titles. This presentation nicely showcases the silly tone of the '60s with only a few minor defects. Audio Transfer Review: Our Man Flint would have benefited well from a more complex transfer, but we must settle with only the English and French mono tracks here. The dialogue is easily understandable, and the fun music plays well, but the format is too limiting. I would have hoped for at least a 2.0-channel Dolby Surround option. The lack of a more complex track does not seriously lessen the viewing experience, but it also does little to increase the enjoyment either. Extras Review: This release contains trailers for this picture and its sequel In Like Flint, which looks extremely similar. Previews also appear for Fathom, which stars Raquel Welch, and Modesty Blaise�"the female answer to Julius Ceasar, Genghis Khan, and the others who burn the city to save civilization." These are the only supplements available on this disc. Our Man Flint was one of numerous films released in the 1960s following the immense popularity of the early Bond pictures. It stands as one of the more watchable entries in the genre with a likable main character, considerable style, and plenty of entertaining moments. The cool gadgets, beautiful women, and exotic locales make this picture enjoyable and worth several hours of your time.